Check out the new deals on Spring dresses from ladies' clothing sale. Casual shirts, pants, and high-quality kids' clothing range is viewable on pg 3. Save with the BOGO deal on jewellery and accessories. You will get the second item for half price. 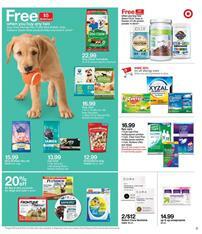 Target Weekly Ad Easter Sale is a fantastic range of products. You might want to replace your shoes with sandals in the conditions of the hot summer climate. Sandals will cost only $10! 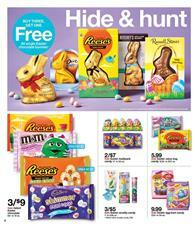 A special Easter candies range of Target is available on pg 6. Reese's, Russell Stover, and more brands are in the content. Buy 3 of these to get 1 free. The deal will be effective for all single Easter bunnies. Easter multipack, value-bag, and chocolate products are also on the same page. Celebrate Easter with traditional activities. Spritz grass and eggs will cost $3 or lower. You can also find gifts under $5, $10, $15 in the toy sale range. Kids will love these plush animals and other Easter toys. Collectable gifts like Uno flip, Disney Doorables, PJ Masks Super Moon space rover, and many more items are in the toy sale of Target. You can also attend the Eggstravaganza event on Saturday. Get a ride at Target. Schwinn 20" Falcon or Deelite kids' bike will cost only $84! Captain Marvel tee is gonna cost only $6! Buy a great game for your friends. Jumanji, Codenames, Bedbugs, and more board games will be BOGO 50% off deal at Target. 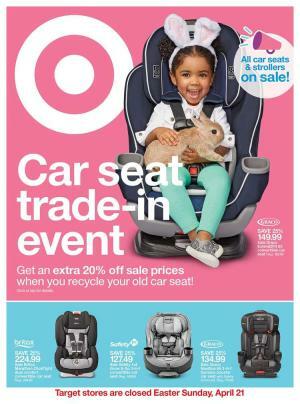 A new Target Weekly Ad sale will be an option to redecorate your living room, use Easter products, and to check out a new collection of clothing for ladies. 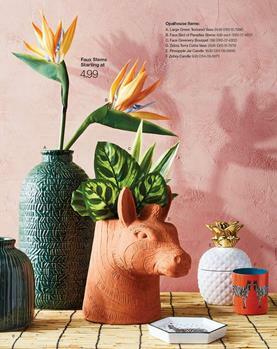 Target Ad is a source of Spring trends for the subjects we mentioned. You have 2 weeks to use these discounts. Buy decoration products that are reflective of a beautiful nature. For example, Opalhouse items like jewellery tray are available on pg 4. Faux stems prices start at $4.99! Faux plants can be a great addition to make your living room a little cosier. 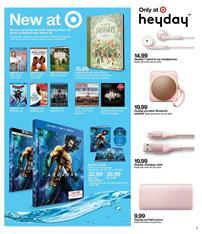 It's possible to find some nice prices of these items on the latest Target Ad. Faux Monstera potted plant will cost only $24.99! More Opalhouse items are viewable on pg 7. Also, redecorate your dining table with dinnerware with a starting price of $2.49! Since Spring and Summer are approaching with a nicer climate, you might want to create a relaxing corner in your backyard. If you need some products like Project 62 items including string lights, outdoor pillow, stoneware planter, and more, check out pg 9. Find more details of the products from this Target Ad Spring Sale. If you want to hear from the weekly ads, savings, and the future news, check out the Facebook page. Find great prices of medical support that you need on a daily basis. Allergy relievers, optical care, personal care products, skin-care, and more of brands like CeraVe, SheaMoisture, and more are available on the Target Weekly Ad. Get a free $5 Gift card when you buy 4 beauty-personal care items from this range. BOGO 50% off All No7 Skincare products. Shop for in-car safety products of kids. One of the popular brands of the industry is the Graco and its 4ever DLX will cost only $299.99! Educational toys are also a part of the Ad. Free $20 Target Gift card with baby department purchase of $100 or more. You have also fan products of baseball. Save 10% with your purchase of Rawlings baseball gear and pay only $39 for Igloo MaxCold Cool fusion 36-can cooler. Browse the currently browsable Target Ad to see all products of this range. Don't forget to check the news on our Facebook page, too. One of the best ways to enjoy your home before Spring is to clean it corner by corner. To do that properly, you need, of course, proper tools and chemicals. 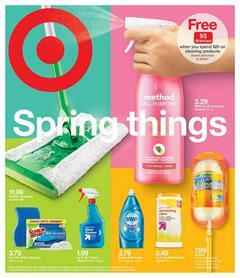 Target Ad has its first page devoted to the cleaning products and consumable products. Buy mops and all-purpose chemicals at Target. Method All-Purpose cleaner is only $3.29. Also, get a free $5 gift card when you spend $20 on cleaning products. Spring range of Target may also meet the requirement of consumables. Restock your bathroom tissue, paper towels etc. up & up paper towels of 8-pk. is $9.19 next week. Target sells Scott bath tissue for only $12.29 for its 15-pk item. Do your laundries before you start to clean the house. Save time with these tools and clean your clothing with high-quality chemicals like Tide laundry detergent which will cost only $11.99! Shop $20-worth products of dish care or household supplies to get free $5 gift card. Moreover, Target has a part for little friends. Dog and cat foods are available on pg 4. Follow our Facebook page to get these deals on your feed. Subscribe to the Target Ad to get emails. Find many more products in the browsable ad pages. You can leave a comment about the products and the whole ad content. Personal care sale, child safety, kids' bedroom, baby care, activewear, smartphones, toys, and more are also available next week at Target. Find the popular video games of the month for PS4 and Xbox One at Target's electronic range. Enjoy the finest level designs of Nintendo games with the Switch console. You can find Turtle beach stealth 300 PS or XB gaming headset for only $59.99 saving your $20! $50 PS and Xbox gift cards are also available in Target Weekly Ad. Save these for the upcoming games like Sekiro. Also, earn $10 gift card for buying Kingdom Hearts III for only $59.99! Hisense, Polaroid, element TVs are basically sufficient monitors to play these. For some console games, you might need HDR feature of your TV. For example, God of War asks for this feature but you can also play otherwise. It increases the quality of your display and motion. EarPods, iPad Pro, Apple Watch Series 4, and iPhone Xr are Apple products from the Target sale. Don't forget to see all these deals if you want to save on electronics. Also, subscribe to get future Target Ads with amazing discounts.